3417 East Martin Luther King, Jr. Blvd. William “Bill the Mailman” Martin was born in Asheville, North Carolina. After graduating from Stephens Lee High School, he moved to New York City to further his studies. He was a music lover and played tenor saxophone. Pursuing a music career, he was accepted into the Julliard School of Music. Although elated over the opportunity to attend Julliard, Bill made a last minute decision to join the U.S. Air Force instead. Bill served in Korea, Japan and England. He was later assigned to Bergstrom Air Force Base in Austin, Texas. There, he would meet the love of his life, Evelyn “Tutter” Franklin. They were married on April 9, 1955 and became the proud parents of William Jr., Toni, Terry, Lori and Lisa with the added joy of 14 grand- and 11 great-grandchildren. Evelyn passed away on October 23, 2005 after 50 years of marriage. While living in New York City, Bill worked for the NY Transit Authority as a subway motorman. While in Austin, Texas, Bill worked as a mail carrier for the United States Postal Service for 31 years, thus given the name, “Bill the Mailman”! Bill has been on the radio for 34 years. He was on air from 5:00 a.m.-10:30 a.m., every Sunday on KLGO-The Word-1490AM. Bill joined the Gospel Music Workshop of America Announcers’ Guild in 1980. His most recent honor is the 2013 Central South Distribution Trailblazer Announcer of the Year Award received in January at the 2013 Stellar Awards held in Nashville, TN. He was also a Nominee for the 2013 Stellar Award Announcer of the Year category. In July 2012, he was honored to receive Announcer of the Year at the 2012 Gospel Music Workshop of America. Bill was the ONE and ONLY recipient at the 2012 Announcers Guild session which was awarded by President Al “The Bishop” Hobbs”. Bill was stunned and humbled to receive this award for the first time in his 32 years of service to the convention. He founded the Texas Gospel Announcers Guild (TGAG) in 1989 with just nine (9) members. To date, TGAG has over 100 members representing over 25 radio stations throughout the state of Texas. He has served as President of TGAG since the inception; the organization will celebrate its 23rd anniversary in November. Bill is a faithful member of the St. James Baptist Church, pastored by Dr. B.W. McClendon. There, he serves as a deacon, Director of General Services, executive board member, male chorus member and promotion resource liaison. He has been instrumental in bringing some of the world’s best and well-known gospel artists to Austin and the Central Texas area. Bill’s favorite pastime is golfing! 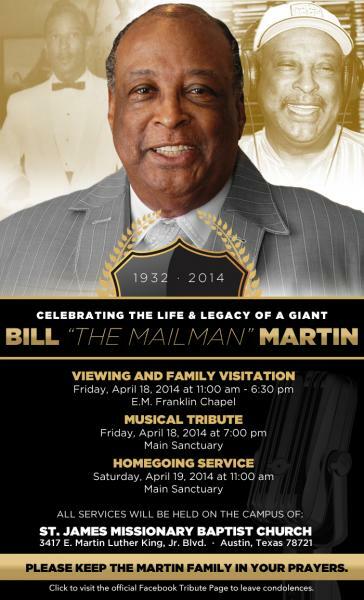 Bill was a Gospel Music Hall of Fame Member and a living legend in Austin for over 35 years.